We are building a nine-kilometre-long sewer pipeline between Donnybrook and Beveridge to cater for growth in Melbourne’s northern growth area. Melbourne’s northern growth area is expected to accommodate a vast amount of Melbourne’s growing population. The Victorian Planning Authority (VPA) is predicting that by 2050 the area will be home to around 300,000 people, with 100,000 homes and supporting around 80,000 jobs. This project is the second stage of the Amaroo and Lockerbie Main Sewer Project. The Lockerbie Main Sewer runs next to the Melbourne to Sydney rail line and connects into the Amaroo Main Sewer at Donnybrook. The 8-kilometre-long Amaroo Main Sewer pipeline construction was completed in June 2017. The Lockerbie Main Sewer will collect and transfer sewage flows from a majority of the proposed new developments and communities in the Donnybrook, Beveridge and Lockerbie area. The nine-kilometre-long pipeline will incorporate up to 14 branch sewer connection points to service future developments. Once finished and the sewer comes ‘online’ it will also collect and transfer wastewater from the existing Wallan Sewage Treatment Plant. 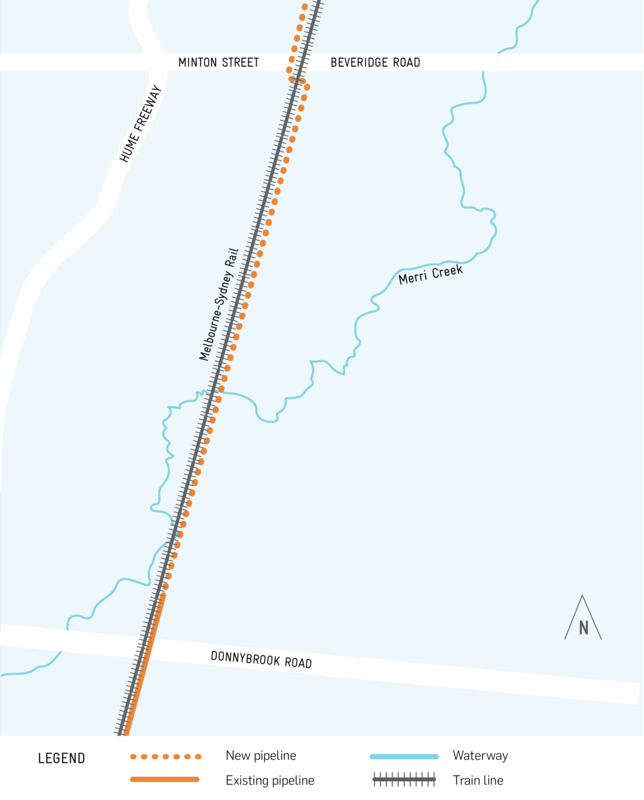 The sewer pipeline will be built between Beveridge and Donnybrook. The pipeline will extend Melbourne’s existing metropolitan sewerage system by nine kilometres from just north of Donnybrook Road, Donnybrook, to around one kilometre north of Minton Street, Beveridge. The pipeline will be constructed along the western side of the Melbourne-Sydney railway line north of Minton Street, then crosses the railway line and hugs the eastern side of the rail line to its southern end in Donnybrook. The completed Lockerbie Main Sewer will begin operating in 2021. The Lockerbie Main Sewer Project is currently in its detailed design stage, which involves investigating the ecology, cultural heritage, service location and ground conditions of the area where construction will occur, to support the design development. Additionally, as part of the Department of Environment, Land, Water and Planning (DELWP) construction approvals process, the Lockerbie Main Sewer Project needs to demonstrate how the design avoids or minimises impacts to the environment and waterways, including Merri Creek. The planning processes for the project was previously established during the planning scheme amendment, approved by the Minister for Planning in November 2014. This was developed in consultation with Hume City Council, Mitchell Shire Council, Whittlesea City Council, the Victorian Planning Authority, the Department of Transport, Planning and Local Infrastructure and the Department of Environment and Primary Industries (now DELWP). Following the approval of the planning scheme amendment, a Public Acquisition Overlay (PAO) was applied to the land required for the sewer. As the project progresses, Yarra Valley Water will be required to seek approvals from DELWP, Melbourne Water and local councils, as needed. As outlined in our 2020 Strategy, Yarra Valley Water is committed to work in harmony with the environment, so minimising impacts to the Merri Creek and the surrounding environment are key considerations when designing and constructing the sewer pipeline. We value our natural environment and waterways and will work to minimise the effects of site investigations as well as the construction, operation and maintenance of the Lockerbie Main Sewer Project on areas that are environmentally sensitive. We will seek approvals from DELWP to undertake these activities, as well as from Melbourne Water, to construct the sewer pipeline near Merri Creek and its tributaries. As part of the project’s design investigations, a Cultural Heritage Management Plan (CHMP) will be developed for the land through which the sewer pipeline will pass underground. The CHMP must be approved by the Registered Aboriginal Party for the area, which in this case is the Wurundjeri Tribe Land and Conservation Cultural Heritage Council.